This article is about the section of U.S. Route 1 in Florida. For the entire route, see U.S. Route 1. U.S. Route 1 (US 1) in Florida runs 545 miles (877 km) along the state's east coast from Key West to its crossing of the St. Marys River into Georgia north of Boulogne, and south of Folkston. US 1 was designated through Florida when the U.S. Highway System was established in 1926. The road is maintained by the Florida Department of Transportation (FDOT). From its national southern terminus in Key West, US 1 carries the Overseas Highway—the Keys main highway north to the mainland, entering South Florida. From South Florida to Jacksonville, US 1 runs close to the coastline of the Atlantic Ocean and the Intracoastal Waterway, generally east of I-95 and west of State Road A1A, running roughly parallel with both roads. North of Jacksonville, US 1 curves inland towards the St. Mary's River as it enters Georgia. State Road 970 from Southwest 2nd Avenue (US 41 west/SR 90 west) to Interstate 95 in Miami, along the Downtown Distributor. Among other designations, US 1 is a designated Blue Star Memorial Highway along its entire route through the state. Markers are placed at various locations, including one in Rockledge, Florida and Fort Lauderdale, Florida. US 1 officially begins at the Monroe County courthouse at the intersection of Whitehead and Fleming Streets, Key West. It proceeds south as Whitehead Street, a two-laned street, until the intersection with Truman Avenue, which takes it east through central Key West. Truman Avenue becomes North Roosevelt Boulevard about a mile east, and remains so until leaving the island; US 1 expands to four lanes along its length. The road follows the northern shore of this section of Key West, then after curving southward, it meets State Road A1A head-on at a T-intersection before continuing east. This intersection also marks the southern terminus of the Overseas Highway, which US 1 is known by between here and mainland Florida. After crossing to Stock Island and forming the boundary between the eponymous district and incorporated Key West, US 1 proceeds through unincorporated Monroe County on Boca Chica Key, past the Naval Air Station Key West, and Rockland Key, where the Overseas Highway drops down to a two-laned road. It then crosses East Rockland Key, Big Coppitt Key (and its congruous district), Saddlebunch Keys, Sugarloaf Key, Park Key, Cudjoe Key (and its congruous district), Summerland Key, Ramrod Key, Middle Torch Key, Little Torch Key, Big Pine Key (and its congruous district), Scout Key, and Spanish Harbor Key. The highway expands to four lanes as it crosses the Bahia Honda Bridge, then reduces to two lanes as it traverses Bahia Honda Key, Ohio Key, Missouri Key, and Little Duck Key. After Little Duck Key, US 1 enters Knight's Key, Boot Key, Key Vaca and the town of Marathon via the Seven Mile Bridge, thus leaving the lower Keys. US 1 runs through Marathon as a four-laned road. After Key Vaca, the road becomes two-laned once more and runs through Fat Deer Key, where it forms the northern boundary of the city of Key Colony Beach. It then continues wholly in Marathon through Long Point Key, Crawl Key and Grassy Key. The road then crosses to Little Conch Key and then Conch Key, both part of the Duck Key district. US 1 then crosses to and traverses Long Key, which is mostly unincorporated except for the city of Layton, which the highway passes through. The road then reaches Craig Key, and then the village of Islamorada including Lower Matecumbe Key, Tea Table Key, Upper Matecumbe Key and Windley Key. US 1 crosses a drawbridge onto Plantation Key, where it expands to four lanes and then leaves Islamorada as it crosses to Key Largo. Immediately the Overseas Highway enters Tavernier, where it temporarily splits into a pair of one-way roads through the community. Soon the road enters the community of Key Largo, which also features another pair of one-way roads. At the northern end of the Key Largo district, about two-thirds of the way along the island, US 1 intersects County Road 905, which offers an alternative route out of the Keys via North Key Largo and the Card Sound Bridge. Signage approaching the intersection directs northbound motorists to take this alternative route if the lights on it are flashing. US 1 swings to the northwest, forms the southern boundary of North Key Largo, and becomes a two-laned divided road after the intersection. After crossing the Jewfish Creek Bridge (where it enters unincorporated Monroe County again) and travelling along Cross Key, US 1 crosses Manatee Creek, along with the Miami-Dade County boundary, and reaches the mainland. For the first 14 miles (23 km) in Miami-Dade County, US 1 is a divided two-lane road bordering the Everglades National Park on the west. It is named South Dixie Highway from the county line to Miami. Its first major intersection is with the north end of Card Sound Road south of Florida City. Similarly to the south, signage directs southbound travelers approaching this intersection to take Card Sound Road if the lights on it are flashing, rather than taking US 1 south to Key Largo. Just north of the Card Sound Road intersection, US 1 meets the southern end of Krome Avenue (State Road 997), and then enters Florida City. Here, US 1 intersects State Road 9336, providing access westwards to Everglades National Park; at the same intersection, Palm Drive (former State Road 906) likewise provides access eastwards to Biscayne National Park. From here northbound, the South Dixie Highway is paralleled by the South Miami-Dade Busway along the former Florida East Coast Railway alignment. Near-immediately northbound of the Palm Drive intersection, US 1 meets the southern end of the Homestead Extension of Florida's Turnpike, and then crosses into Homestead at South 328th Street. The road then curves northeast through Homestead, parallel to Florida's Turnpike, leaving the city north of South 304th Street, continuing northeast through the communities of Leisure City, Modello, Naranja, Princeton, and Goulds. 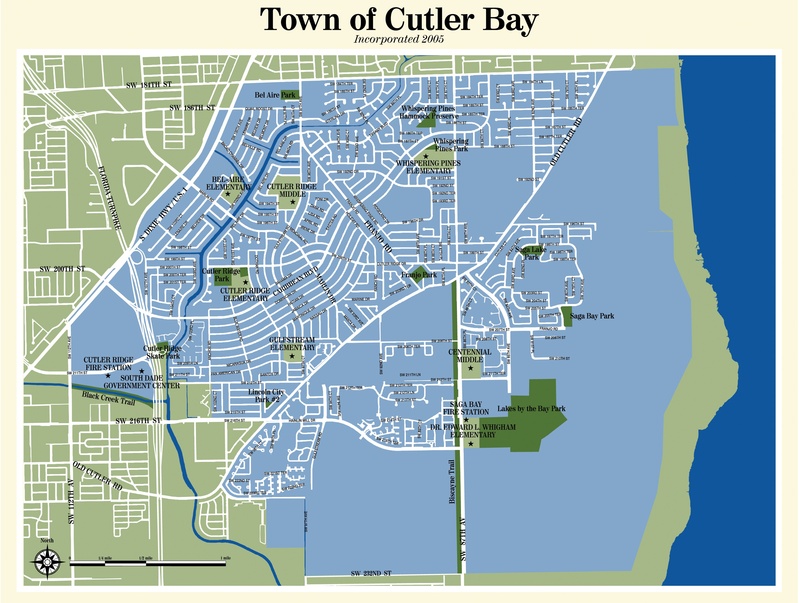 At West 112th Avenue/Allapattah Road (SR 989), US 1 enters the incorporated town of Cutler Bay (formerly Cutler Ridge), soon passes under the Homestead Extension of Florida's Turnpike, and continues northeast in the town until at South 186th Street it forms the town's border for two blocks before leaving at South 184th Street. From here, the road continues northeast from this point, forming the western boundary of Palmetto Bay. In Perrine, it meets State Road 994, and then divides into a one-way pair of streets, with northbound traffic directed east one block of the southbound traffic along a sweeping curve between South 183rd and South 168th Streets. After the two directions of traffic rejoin, the road meets Coral Reef Drive (SR 992), then passes though Rockdale and Howard until it reaches South 136th Street (Howard Drive), meets the southern terminus of State Road 973 a block later, and serves to divide Pinecrest to the southeast and Kendall and Dadeland to the northwest for the next few miles. The road is also known as Pinecrest Parkway through this section. Also through this section, US 1 meets the eastern terminus of State Road 990, the southern terminus of the Palmetto Expressway (State Road 826), and the eastern terminus of State Road 94 at Kendall Drive. North of Snapper Creek (Canal C-2), US 1 continues northeast and enters another section of unincorporated Miami-Dade County. Here, US 1 forms the Snapper Creek Expressway's (State Road 878)'s eastern terminus. The Dadeland South Metrorail station lies just south of the Expressway, on US 1's northern side, and acts as the handover point between the South Miami-Dade Busway and the Metrorail line, which proceeds to parallel US 1 for most of its subsequent journey into downtown Miami. The South Dixie Highway then crosses into South Miami at South 80th Street. At State Road 959 (Red Road/West 57th Avenue), US 1 leaves South Miami and enters Coral Gables, still headed northeast. At West 38th Avenue (Brooker Street), it leaves Coral Gables and enters Miami, heading northeast towards the southern terminus of Interstate 95 just south of downtown Miami. Until 2014, US 1 became Brickell Avenue. As of June 2013, FDOT has agreed to relinquish Brickell Avenue to the city of Miami in a swap for other local roads. In October 2013, AASHTO approved a re-location of US 1 along the Downtown Distributor (SR 970) and I-95. American Airlines Arena on Biscayne Boulevard. US 1 can be seen on the right side of the picture. In Miami, US 1 first intersects State Road 976, followed by the south end of State Road 9, which ends up running concurrent with Interstate 95, and is also I-95's state designation through most of Florida. About a mile east, it meets the national southern terminus of I-95, which is joins over the Miami River into downtown. Biscayne Boulevard in Downtown Miami. The road is then named Biscayne Boulevard through the rest of Miami-Dade County as it proceeds north on Biscayne Bay. As Biscayne Boulevard, US 1 becomes a one-way pair at an intersection with State Road 970. Two blocks north, it reaches State Road 968 (Flagler Street), the north-south baseline for most of Miami-Dade County. US 1 then passes by the western end of Bayfront Park, and then intersects Port Boulevard (NE 6th Street), providing access to the Port of Miami, with the American Airlines Arena at the northeastern end of the intersection. For the next few blocks, it passes by Bicentennial Park, with Interstate 395 at the northern end, which also marks the national southern terminus of US 41. US 1 continues through midtown Miami, intersecting with the national southern terminus of U.S. Route 27 one block south of Interstate 195 next to the Julia Tuttle Causeway. North of I-195, the road continues through Miami as a residential road, intersecting State Road 944, State Road 934, and State Road 915 before leaving Miami. Moving further inland, the Boulevard replaces East Sixth Avenue at 61st Street. It enters the village of Miami Shores at North 87th Street. Crossing the Biscayne Canal, Miami Shores becomes North Miami. In North Miami, it intersects State Road 922, leading to the Broad Causeway and State Road 916. In North Miami Beach, it intersects State Road 826, and State Road 860. The road enters Aventura at Greynolds Park. It continues north-northeast through the city of Aventura, curving due north at North 187th Street and northeast at North 203rd Street. In Aventura, it intersects State Road 856 at the southwest of the Aventura Mall, and after intersecting the former State Road 854, it leaves Miami-Dade County. Entering Broward County near Hallandale Beach, US 1 first intersects State Road 858. Next it meets the eastern terminus of State Road 824, which provides access to Miramar and Pembroke Pines. Entering Hollywood, it intersects State Road 820 in a traffic circle around Anniversary Park. In Dania Beach it meets State Road 822 and State Road 848. Here State Road A1A also begins running concurrent with the road just south of Fort Lauderdale-Hollywood International Airport for a few miles. Near the southeastern corner of the airport it meets the eastern terminus State Road 818. It then proceeds to go around the eastern edge of the airport. On the northeastern corner it meets I-595. Now in Fort Lauderdale as Federal Highway, it meets the eastern terminus of State Road 84. Another ½ mile past here A1A ends its concurrency with US 1 and returns to the barrier island. 1 mile south of downtown it meets the eastern terminus of State Road 736. The road enters downtown Fort Lauderdale via the New River Tunnel, one of only a few underwater road tunnels in the state (the other on a state road being the Port of Miami Tunnel). The next major intersection is with State Road 842. It then turns east for 1 mile in concurrency with State Road 838 before separating again and turning north. The last two major intersections in Fort Lauderdale are with State Road 816 and State Road 870. US 1 then enters Pompano Beach. As it makes its way through Pompano Beach it intersects State Road 814. It then passes by the Pompano Beach Airpark and the Pompano Beach Golf Club. The road then proceeds to enter Deerfield Beach, where it meets SE 10th Street and State Road 810. It then crosses the Hillsboro Canal and exits Deerfield Beach and Broward County. As US 1 enters Palm Beach County and Boca Raton, it forms the western boundary to Royal Palm Yacht and Country Club, meeting with the northern terminus of the southern section of State Road 811. It passes through the heart of Boca Raton, becoming a divided road with three lanes each, becoming the eastern terminus of State Road 808, as well as intersecting State Road 800, and becoming the eastern terminus of State Road 794. US 1 then enters Delray Beach, becoming a one-way pair just north of Linton Boulevard, and meets State Road 806 in central Delray Beach. US 1 becomes a divided highway again, entering Boynton Beach, State Road 804 runs concurrent for 2 blocks, providing access to local beaches at Ocean Ridge via the Intercoastal Waterway. At the city limits of Lake Worth and Lantana, just north of Lantana Road, US 1's hidden designation, State Road 5 splits and runs parallel to US 1 a few blocks to the east. In central Lake Worth US 1 intersects State Road 802. Entering West Palm Beach, it first intersects State Road 882, followed by US 98/State Road 80. At Belvedere Road, it meets the northern end of State Road 5. In central West Palm Beach, it intersects State Road 704, where US 1 becomes a one way pair through the heart of West Palm Beach. A mile north of SR 704, A1A begins running concurrent with US 1. At Palm Beach Lakes Boulevard, the one way pair ends for US 1, continuing north for 11 blocks, until it hits 23rd/25th street, becoming a one way pair for 4 blocks, as US 1 moves two blocks west as it moves north. US 1 leaves West Palm Beach and enters Riviera Beach via a bridge over the Port of Palm Beach. In Riviera Beach, US 1's concurrency with SR A1A ends at State Road 708. In North Palm Beach it meets the eastern terminus of State Road 850 and State Road 786, where SR A1A becomes concurrent with US 1 for about 1.25 miles before splitting off at the southern end of Juno Beach. In Jupiter it intersects State Road 706, and has another concurrency with SR A1A just south of the Jupiter Inlet. Entering Tequesta at the northern end of the inlet, US 1 then meets up with the northern terminus of the northern portion of SR 811, and leaves Palm Beach County north of County Line Road. As US 1 makes its way into Martin County, it passes through Jonathan Dickinson State Park before crossing over the Florida East Coast Railway tracks. At the southern end of Hobe Sound, A1A splits off onto its own route. The two roads parallel each other until Stuart. Through the center of Hobe Sound it intersects County Road 708. It then leaves Hobe Sound and enters Port Salerno before it enters the heart Stuart, where it intersects State Road 714 near SR 714's eastern terminus at the northwestern end of Witham Field. SR 714 ends less than a mile east at A1A. Through the center of Stuart it meets State Road 76. US 1 then crosses a bridge over the St. Lucie River. North of the bridge it crosses over the Florida East Coast Railway tracks again and meets County Road 707. Two miles north of the river, it leaves Stuart and enters Jensen Beach, intersecting Jensen Beach Boulevard and passing by Treasure Coast Square. One and a half miles north of Treasure Coast Square, US 1 leaves Martin County. US 1, looking north from the Harbor Branch Oceanographic Institute entrance. As US 1 enters Port Saint Lucie it first meets the eastern terminus of Port Saint Lucie Boulevard. In the future, it will intersect with the Crosstown Parkway approximately halfway between Prima Vista and PSL Boulevard (the final routing over the Saint Lucie River is still being worked out). Continuing north into White City it intersects County Road 712 (Midway Road). In Fort Pierce it meets the eastern terminus of State Road 70 and State Road 68. A one mile long concurrency with A1A begins a few blocks north of SR 68 as the two roads enter the village of Saint Lucie. After A1A diverges back to its own route to the beach, US 1 intersects State Road 608. As it continues north of it meets the eastern terminus of State Road 615, State Road 614, as well as State Road 713. North of SR 713, US 1 veers east, crosses the Florida East Coast Railway tracks, and leaves St. Lucie County. Intersection of CR 510 and US 1, in Wabasso. US 1 enters Indian River County just north of the SR 713 intersection, with its first major intersection in the county being County Road 606 in Oslo. US 1 then runs parallel with the Florida East Coast Railroad, entering central Vero Beach, where it's locally known as Commerce Boulevard. It intersects SR 656 (16th/17th Street), and State Road 60 (20th Street), and passes by the eastern end of the Vero Beach Municipal Airport. At the northeast end of the airport, US 1 has an intersection with State Road 605, with SR 605 paralleling US 1 one block to the west before leaving Vero Beach. North of Vero Beach, US 1 travels through the villages of Gifford and Winter Beach. In Wabasso, US 1 intersects State Road 510, where US 1 begins a concurrency with Indian River Lagoon Scenic Highway. US 1 then intersects with SR 605 one block north of SR 510. US 1 then travels north to central Sebastian, where it intersects with CR 512 (Sebastian Boulevard), providing access to Fellsmere and Interstate 95. It then enters Roseland, intersecting CR 505 a half mile south of US 1's crossing of the St. Sebastian River, where it leaves Indian River County. Brevard/Volusia county line near Scottsmoor. US 1 enters Brevard County at the north end of the St. Sebastian River, continuing to hug the western shoreline of the Indian River. The first community it enters is Grant-Valkaria, with intersections with Micco Road, followed by Valkaria Road just east of the Valkaria Airport. US 1 then travels north to Malabar, intersecting State Road 514. It continues north to Palm Bay, through the central area of the city, with an intersection of County Road 516 (Palm Bay Road). It is locally designated the Johnson-Grogan Highway from South Palm Bay city limits to the Melbourne city limits. As US 1 enters Melbourne, the road veers a few blocks west of the Indian River, heading towards an intersection of U.S. Route 192 at the 1900 Building. A few blocks north, US 1 returns to the shoreline of the Indian River and then intersects State Road 508, followed by State Road 507, with US 1 veering away from the Indian River and crossing the Elbow Creek Bridge. Just north of the bridge, it enters the Eau Gallie portion of Melbourne, and intersects State Road 518. It then enters Palm Shores, another portion of Melbourne, leaving it just south of State Road 404, the Pineda Causeway. 1.8 miles (2.9 km) north of the intersection is the community of Pineda. In Rockledge, US 1 intersects with CR 515 and the Indian River Lagoon Scenic Highway follows that road for 14 miles (23 km), as US 1 stays a few blocks west of the river. North of Rockledge, it enters Cocoa, running through Historic Cocoa Village on the west side, and intersecting State Road 520. North of Cocoa, it intersects State Road 528, the lone expressway US 1 crosses in Brevard County. In Brentwood Heights, US 1 intersects CR 515 again, with US 1 resuming its status as the Indian River Lagoon Scenic Highway. US 1 continues north to Titusville, first intersecting with State Road 405, with east SR 405 leading to NASA Parkway and the main entrance of the John F. Kennedy Space Center on Merritt Island. Still in Titusville, it intersects State Road 50. Now in central Titusville, US 1 intersects SR 405 again, and State Road 406, where the Indian River Lagoon Scenic Highway ends on US 1 and proceeds onto east SR 406. North of Titusville, US 1 steers away from the Indian River and travels in a parallel direction with Interstate 95 from here to the Volusia County line. In Scottsmoor, just south of the Volusia County line, it intersects CR 5A, a 1-mile (1.6 km) spur route of the road itself. US 1, looking north from the median, in Oak Hill. The road enters Volusia County just north of Scottsmoor, where US 1 branches away from I-95 and in a northeast direction towards the coast. At the intersection of State Road 3 in Oak Hill, US 1 turns north, aligned with the coast. US 1 continues through central Oak Hill, intersecting County Road 4164. US 1 then continues north to Edgewater, where it meets with SR 442, and meets with County Road 4136 (Park Avenue) before leaving Edgewater. In New Smyrna Beach, it crosses under State Road 44 and CR A1A, starting another concurrency with SR A1A. It continues through central New Smyrna Beach, passing by the New Smyrna Beach Municipal Airport, and leaving the town via a crossing of Spruce Creek and Rose Bay, entering Allandale. A few blocks north of the creek, US 1 intersects State Road 5A, a bypass running north to Ormond Beach. Now in Port Orange, US 1 runs through the core of the town, intersecting State Road 421/State Road A1A, ending another concurrency with SR A1A. A1A connects to the barrier island via the Port Orange Causeway. US 1 then enters South Daytona, with intersections with Reed Canal Road and Big Tree Road. It then enters Daytona Beach, locally known as Ridgewood Avenue as it runs through the central part of the town. US 1's journey through Daytona Beach begins with an intersection with SR 400, which will become unsigned on Interstate 4 west of I-95. Through Daytona Beach, US 1 provides access to four bridges crossing to the barrier island; the Memorial Bridge, followed by the Carlton Blank Bridge, which carries US 92, the Main Street Bridge and the Seabreeze Bridge. It crosses SR 430 before leaving Daytona Beach and entering Holly Hill. In Holly Hill, it intersects County Road 4019 (LPGA Boulevard/11th Street), which is home to the LPGA headquarters. It then enters the city of Ormond Beach, where US 1 is known and Younge Street, intersecting State Road 40, and running parallel with County Road 4079. As US 1 heads northwest, it then intersects State Road 5A, the northern end of the bypass. It then crosses the Tomoka River before leaving Ormond Beach. A few miles northwest, it then meets Interstate 95, passing through some hotels and fast food restaurants as it crosses under the interstate. US 1 leaves Volusia County west of I-95. US 1 runs west of I-95 throughout its journey in Flagler County, running in a northwest direction. The first major intersection in the county is with Old Dixie Highway in Korona. From there, it enters Dupoint, intersecting County Road 304, followed by Belle Terre Parkway. It then enters Bunnell, where it's known as State Street, with an intersection of SR 11/State Road 100, with a brief concurrency with SR 100. The SR 100 concurrency ends with an intersection with State Road 20/State Road 100. North of Bunnell, US 1 intersects Old Dixie Highway (County Road 13). US 1 then straddles the western end of Palm Coast, with an intersection with Palm Coast Parkway (County Road 1424) near the northern end of the city, providing access to Interstate 95. Leaving Palm Coast, it intersects Old Kings Road, and then leaves Flagler County via a crossing of the Pellicer Creek bridge. US 1 enters St. Johns county at the northern end of Pellicer Creek, and quickly intersects with County Road 204 just south of the Interstate 95 interchange. At the I-95 interchange, US 1 stays east of the interstate, and heads into an undeveloped area. At State Road 206, The road is slightly more developed, as US 1 heads towards St. Augustine Shores, followed by St. Augustine South at the crossing of Moultrie Creek. It then enters St. Augustine, first intersecting with State Road 312, followed by State Road 207, where US 1 is now known as Ponce De Leon Boulevard. Heading north, it intersects US 1 Business, known locally as King Street, and a tourist route through Old St. Augustine. Just north of the intersection, it crosses the San Sebastian River, and then straddles on the eastern riverbed. At the northern end of St. Augustine, it intersects State Road 16, followed by US 1 Business five blocks later. After leaving St. Augustine, it passes by the western end of the Northeast Florida Regional Airport, and cuts through wetlands to Durbin. At the northernmost intersection with County Road 210 at Race Track Road, US 1 crosses the Duval County line and enters Jacksonville. From St. Johns County, US 1 starts its journey through Duval County and Jacksonville at Race Track Road, where it becomes the Philips Highway, a 17 mile long section of US 1 south of Downtown Jacksonville named after Judge Henry Bethune Philips, the first chairman of the State Road Board, predecessor of the Florida Department of Transportation. It heads north through the sparsely developed sections of southeast Jacksonville, intersecting the future Interstate 795 interchange, followed by Old St. Augustine Road in Bayard. It continues northeast, intersecting Greenland Road and Interstate 295 East Beltway. North of I-295, US 1 enters a commercial area with multiple furniture stores, with an intersection with State Road 115. A 1/2 mile northwest is an interchange with I-95. A few miles north, US 1 intersects Sunbeam Road (County Road 116), which connects to State Road 13. It then heads to State Road 152, locally known as Baymeadows Road. As US 1 heads towards the heart of Jacksonville, it intersects with State Road 202, locally known as JTB Boulevard, a freeway through eastern Jacksonville. US 1 then heads towards Bowden Road, providing access to southbound I-95, followed one block later by State Road 109, locally known as University Boulevard. A few miles north, it intersects Emerson Street, signed as U.S. Highway 1 Alternate to the east and State Road 126 to the west. It then intersects St. Augustine Road and Philips Highway ends at I-95 exit 348. Main Street Bridge from Downtown Jacksonville. North of Philips Highway, US 1 continues as Kings Avenue, running within a block of I-95. One block north of I-95, it intersects U.S. Route 90, and starts a concurrency as the two highways head north. After crossing under I-95, the road intersects State Road 13 twice, heading towards the Main Street Bridge, crossing the St. Johns River. North of the bridge, the road becomes a one-way pair, named Ocean Street northbound and Main Street southbound. It then intersects State Road 228, starting a concurrency. Several blocks north, it ends the US 90 concurrency and begins a concurrency with US 90 Alternate. It then intersects with State Road 115, and the national southern terminus of U.S. Route 23. It also ends the concurrencies of US 90 Alternate and SR 228. It also starts a concurrency with U.S. Route 17. At that point, the one-way pair ends, and US 1 leaves downtown as Main Street. It then intersects US 1 Alternate, and the road heads west on the Martin Luther King Jr. Parkway, ending the concurrency with US 17, which heads north. At this point, US 1 changes its unsigned state road from SR 5 to State Road 15. U.S. 1 then intersects I-95 one last time on a cloverleaf interchange on exit 354A; the two highways will not meet again until Virginia. U.S. 1 continues west, with the parkway ending with an intersection of U.S. Route 23, which US 1 shares a concurrency with from here to the Georgia state line. The road continues northwest, intersecting State Road 111, and crossing the Ribault River just north of that intersection. US 1 then intersects State Road 115A. Just south of the I-295 West Beltway, it passes west of the Little Trout River. It then has an interchange with the I-295 West Beltway, followed by an intersection with Trout River Boulevard. US 1 then crosses the Trout River, a tributary of the St. Johns River, and intersects State Road 104 immediately north of the river. The road then heads towards the Thomas Creek Conversation Area, leaving Duval County at the Thomas Creek Bridge. North of the Thomas Creek Conservation Area, it enters Nassau County, and Nassau Village-Ratliff. It next heads to Callahan, where it intersects with State Road 115. At the center part of town, it intersects the northern terminus of State Road A1A and State Road 200, as well as starting a concurrency with U.S. Route 301 that continues beyond the Georgia state line. Just north of Callahan, US 1 intersects County Road 115. US 1 heads north towards Hilliard, which contains an intersection with CR 108. Heading north towards Georgia, it passes by a welcome center on the southbound side in Boulogne, followed by an intersection with CR 121/Lake Hampton Road, the last intersection before US 1 crosses the St. Marys River and the Georgia state line. Prior to 1993, red highway shields were used on U.S. 1 in Florida. U.S. 1 was designated nationwide on November 11, 1926, running from Miami, Florida north to Fort Kent, Maine. The label was generally applied to the Atlantic Highway, except between Jacksonville, Florida and Augusta, Georgia, where a more inland route was chosen. In Florida, U.S. 1 was designated along the full length of State Road 4. South of Jacksonville, this was both the Atlantic Highway and the eastern division of the Dixie Highway; the route from Jacksonville northwest into Georgia was a Jacksonville-Macon, Georgia Dixie Highway connector. The beginning of U.S. 1 as of March 1951. With the Overseas Highway being completed in 1938, U.S. 1 was extended from Miami over the Overseas Highway (State Road 4A) to Key West shortly afterward, where it still ends today. The section of US 1 between Miami and Jacksonville has been replaced by Interstate 95 for most through traffic. In Florida, where signs for U.S. highways formerly had different colors for each highway, the "shield" for US 1 was red. Florida began using the colored shields in 1956, but during the 1980s the Manual on Uniform Traffic Control Devices was revised to specify only a black and white color scheme for U.S. Highway shields. As such, Federal funds were no longer available to maintain the colored signs. On August 27, 1993, the decision was made to no longer produce colored signs. Since then, the remaining colored signs have been replaced gradually by black-and-white signs. 808.002 US 1 Alt. north / SR 126 (Emerson Street) to I-95 Southern terminus of US 1 Alt.